Write a PHP script to display the following strings. String: A string is series of characters, where a character is the same as a byte. PHP supports a 256-character set, and hence does not offer native Unicode support. Note: As of PHP 7.0.0, there are no particular restrictions regarding the length of a string on 64-bit builds. On 32-bit builds and in earlier versions, a string can be as large as up to 2GB (2147483647 bytes maximum). single quoted: The simplest way to specify a string is to enclose it in single quotes (the character '). double quoted: The simplest way to specify a string is to enclose it in single quotes (the character "). heredoc syntax: A third way to delimit strings is the heredoc syntax: <<<. After this operator, an identifier is provided, then a newline. nowdoc syntax (since PHP 5.3.0): Nowdocs are to single-quoted strings what heredocs are to double-quoted strings. A nowdoc is specified similarly to a heredoc, but no parsing is done inside a nowdoc. 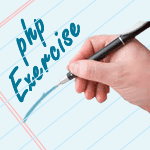 Previous: Write a PHP script to get the PHP version and configuration information. 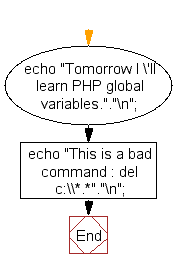 Next: $var = 'PHP Tutorial'. Put this variable into the title section, h3 tag and as an anchor text within an HTML document.